Zeeland Little League is proud to call Kaat Fields their home ballpark for baseball games at the Majors and AAA level. Jim is a Zeeland native and longtime Zeeland Little Leage and Zeeland Rec supporter in many, many ways. See below for a brief bio on Mr. Kaat. James Lee Kaat (born November 7, 1938), nicknamed "Kitty", is an American former Major League Baseball (MLB) pitcher for the Washington Senators/Minnesota Twins (1959–73), Chicago White Sox (1973–75), Philadelphia Phillies (1976–79), New York Yankees(1979–80), and St. Louis Cardinals (1980–83). His 25-year career spanned four decades. Kaat attended Hope College in Holland, Michigan, and pitched for the Flying Dutchmen baseball team, before being signed by the Washington Senators as an amateur free agent in 1957. Kaat would spend all of 1957 and '58 in the minor leagues before reaking into the majors in 1959. After pitching in 16 games spread out over the next two seasons, Kaat became a permanent member of the pitching staff when the team moved west in 1961 to become the Minnesota Twins. On July 24, 1963 Jim Kaat threw a complete-game shutout and hit a home run for a 5–0 Twins win over the Indians. The combination has only happened three times in Minnesota history and Kaat did it twice (with the second coming on October 1, 1970). Kaat was an All-Star for three seasons and a Gold Glove winner for sixteen seasons. He was the American League (AL) leader in shutouts (5) in 1962, and the AL leader in wins (25) and complete games (19) in 1966. In addition to his 283 career wins, he has three 20-win seasons. After a brief stint as a pitching coach for the Cincinnati Reds under former player Pete Rose, he went on to become a sportscaster and for the next 22 years called games for the New York Yankees and the Minnesota Twins. Following a brief retirement in 2006, Jim Kaat was back in the broadcast booth calling Pool D for the 2009 World Baseball Classic in Puerto Rico, called games for NESN in 2009 (as a replacement for Jerry Remy), and currently calls games for the MLB Network as of the 2018 season. He has written a best-selling book, Still Pitching, and has started a sports management company, Southpaw Enterprises, Inc., solely representing pitchers. 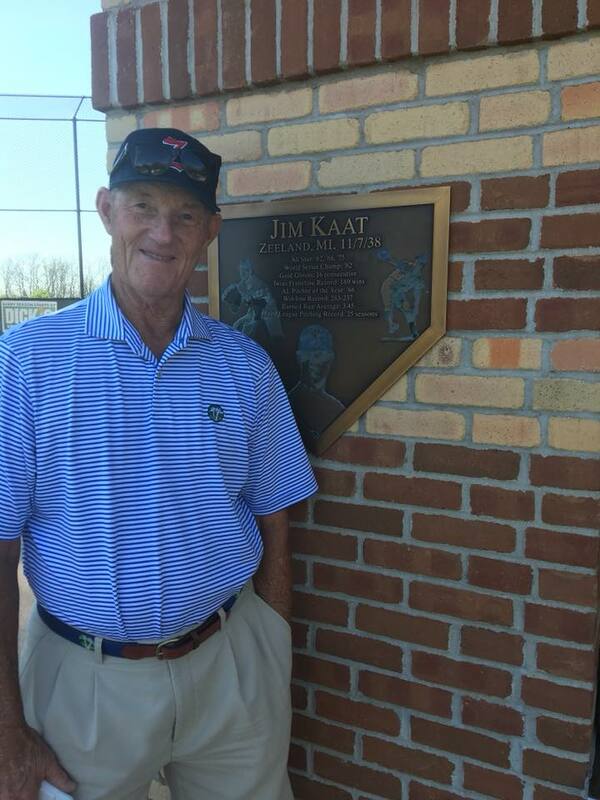 In 2014, Kaat appeared for the second time as a candidate on the National Baseball Hall of Fame's Golden Era Committee election ballot for possible Hall of Fame consideration for 2015 which required 12 votes. He missed getting inducted in 2015 by 2 votes. None of the candidates on the ballot were elected. The Committee meets and votes on ten selected candidates from the 1947 to 1972 era every three years.